A multi-law enforcement agency collaborative focusing on selected high-risk male offenders between the ages of 17-30 who are most likely to recidivate. Inmates are given community mentors and case managers to assist them throughout their sentence and transition back into the community. 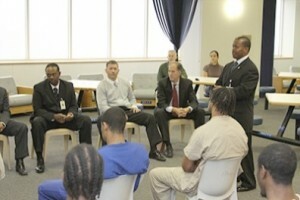 Offenders also participate in a job skills workshop to provide them with employment and a resume. The RED team introduces the Inmate Discharge Plan during Orientation, monitors inmates progress along with the casework staff during the incarceration, provides resources in the library and one on one reviews sixty-days prior to release and facilitates referrals to programs and resources in the community. The objective of this program is to mentor and manage inmates in a community setting, with a goal of early reintegration into the community with no adverse effect to public safety. Offenders must be within six months of completing their sentence or have been granted parole. Community Supervision participants must have a home plan approved by field officers. While in the community, the client must maintain employment or attend school (part-time or full-time). A residential community pre-release house for male offenders provides a structured and transitional environment with a capacity for up to fifty residents. Brooke House’s goal is to change offender criminal behavior and thinking, and to prepare residents for successful re-entry to their communities through assistance with employment, addictions, housing and other identified needs. The Suffolk County Sheriff’s Department, through the Community Works Program (CWP), sends properly classified inmates nearing the completion of their sentences into communities, under the constant watch of an armed Sheriff’s deputy, to provide labor for many city, state and town projects. Cleaning vacant lots, beautifying roadway intersections, painting street lamps, boarding and securing abandoned homes and shoveling senior citizen housing walkways are just some of many innovative jobs the inmates complete. The Community Works Program is involved in assisting the community and we undertake only those projects that may never be completed due to costs restraints or lack of personnel. CWP is an essential part of vocational and job training services provided to offenders before release from the Suffolk County House of Correction. ROCA’s goal is to establish a link to incarcerated men so that, upon their return to the community they will have a connection to the agency and its resources which include ESOL, pre-GED, GED and job preparation peacemaking circles, and leadership development. Caseworkers will submit information for inmates who have child support obligations. Clients are identified through DOR’s system and are scheduled for appointments with DOR representatives if there is a need.